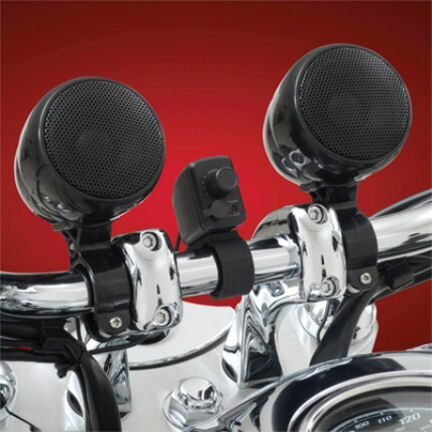 This is a compact high fidelity motorcycle 40 Watt Stereo Speaker System with unbelievable sound. We have tested these. They look and sound great. Very surprising at how much sound comes out of these speakers. For the price you can not go wrong. Includes Universal 7/8" & 1" Bar mounts. Also included are Mirror Mount and Flat Mount Brackets which will allow mounting to H-D and Metric Cruisers and almost any ATV / UTV / Motorcycle / Snowmobile or watercraft. The custom engineered waterproof Speakers are a compact 2 1/2” in a chrome housing, but bring an unprecedented sound quality much bigger than their size. The waterproof Volume Control with its 3.5mm universal aux-in connection is compatible with iPod, MP3, Portable Players and Satellite Radio Systems. Multiple Mounts included for a flat surface, 7/8” or 1” handlebar and mirror mount brackets allow mounting to almost any ATV/ UTV/ Motorcycle/ Snowmobile or Watercraft. The waterproof 40 watt class D amplifier is part of the key in delivering such great sound. * 2 Speakers with 64 inch lead length each for hooking up to the Amplifier. 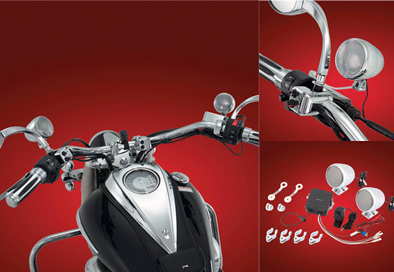 * Mounts for Handlebars, Mirror Mounts or Flat Mount, Choose your best option. * Amplifier with fused power lead. Size 3 1/2" x 3 1/4" x 1 1/4". Can be easily installed inside a side cover, under your seat, etc. * Volume Control / Audio input. Mount for Handlebars included, but can be put anywhere you want. Size: 1 1/2" x 1 3/4" x 1". All In One Stereo Radio System. Hi-Fi Powerful 2 1/2" Speakers. 2x40 Watts Class D Amplifier. Volume Control and Audio Input mounted in a convenient location that you select. Built In AUX-In 3.5mm Plug Port. Fits Handlebars 7/8", 1", Mirror Mounts and Flat Mounts, Easy Handlebar Mounting. Red LED lets you know when the Amp is on. The amplifier has an auto on/off system to help save power. The amplifier automatically turns on when you turn your music on when plugged into the AUX-In Port of the Volume Control. The amplifier also automatically turns off when you either turn your music off or remove the cable from the AUX-In Port. The Amplifier has a protective thermal fuse device to protect both amplifier and speakers from short circuiting. This system is compatible with audio devices that have an AUX-IN 3.5mm jack and the system is highly adapted to condition changes in the environment, including humidity and temperature. Complete with waterproof accessories, the amplifier and speakers carry IP 68 rating and IP 65 rating respectively. The speaker housing is not metal. Speaker Housing is 3" total Length, Center-Line of Handlebar Mount back is 3/4". You will need an Audio Cord to hook your music source to these speakers. We have them available in Related Items below. We highly recommend these Audio Cords, they are heavy duty and have a 90 deg plug on one end. Click here for Video of this product.